Bielefeld, March 22nd, 2016: LaVision BioTec, developers of advanced microscopy solutions for the life sciences, report on the work in the Tews Laboratory which is studying the molecular mechanisms of tumor invasion using an UltraMicroscope for enhanced imaging of cells. Ultramicroscopy forms a toolkit with magnetic resonance imaging (MR-UM) to provide insight into the dynamics of glioma angiogenesis. Dr Julia Bode is a post-doctoral researcher studying the molecular mechanisms of tumor invasion in the Tews Laboratory. This is a part of the famous Schaller Research Group at the University of Heidelberg and the DKFZ, the German Cancer Research Center. The focus of her research is glioblastoma, the most aggressive brain tumor, the prognosis of which is poor for patients reflected by a median survival time of about 14 months. The invasive nature of glioma cells mainly accounts for their resistance to current treatment modalities, as the diffusely infiltrating tumor cells, which evade surgical resection and survive treatment, inevitably give rise to reoccurring tumors. The Group is interested in lysophospholipid signaling which depends on the extracellular matrix environment in vitro and in vivo. They also analyze tumor cell-specific signaling of respective G-protein coupled receptors (GPCRs) regulating cell division, migration and invasion. For this, they use the UltraMicroscope II from LaVision BioTec. The background of the Group is in analysing tumor growth, invasion and volume in vivo using techniques including Bioluminescence Imaging (BLI), Single Photon Emission Computed Tomography (SPECT) and Magnetic Resonance Imaging (MRI). The resolution of these techniques is not high enough to detect single cells. 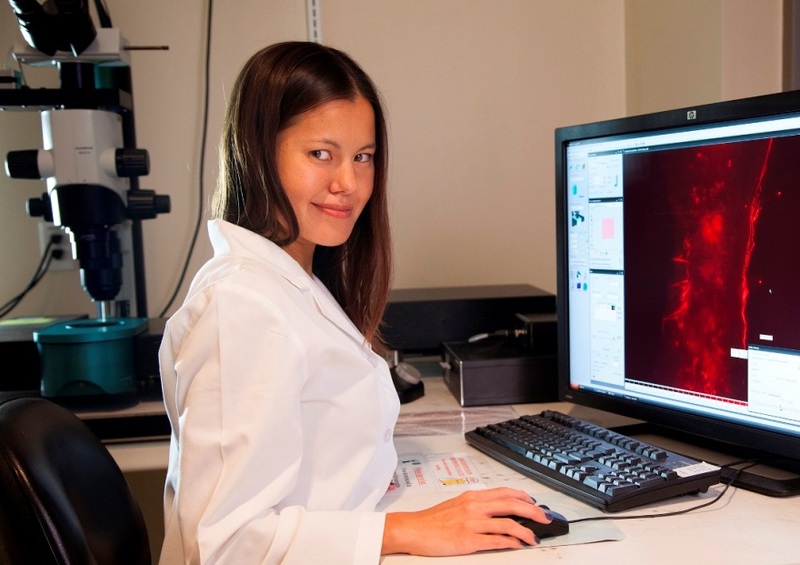 With the Ultramicroscope, they are able to track single tumor cells in the whole mouse brain and can investigate structures that are favoured by tumor cells for invasion. Prior to selecting the UltraMicroscope, we used 2-Photon Microscopy to detect tumor cells. However, key advantage of the Ultramicroscope is to see the tumor cells in their natural environment in the whole brain. They are able to locate cells in 3-dimensions in the whole organ and do not have to prepare single slices. 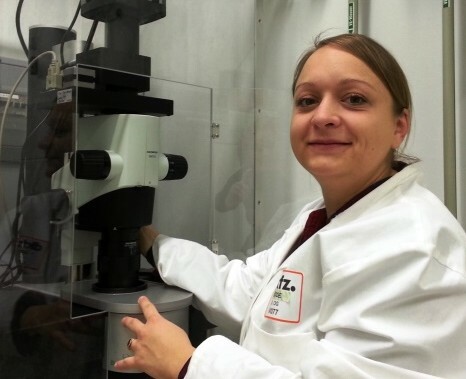 Dr Julia Bode with the LaVision BioTec Ultramicroscope II used in her research at the German Cancer Research Center. 1. Correlated magnetic resonance imaging and ultramicroscopy (MR-UM) is a tool kit to assess the dynamics of glioma angiogenesis. Breckwoldt MO, Bode J, Kurz FT, Hoffmann A, Ochs K, Ott M, Deumelandt K, Krüwel T, Schwarz D, Fischer M, Helluy X, Milford D, Kirschbaum K, Solecki G, Chiblak S, Abdollahi A, Winkler F, Wick W, Platten M, Heiland S, Bendszus M, Tews B. Elife. 2016 Feb 2;5. pii: e11712. doi: 10.7554/eLife.11712. Bielefeld, 14th October 2014: LaVison BioTec, developers of advanced microscopy solutions for the life sciences, report on users of their Ultramicroscope Light Sheet Fluorescence Microscope system to aid the research of the Miami Project to Cure Paralysis under the supervision of Professor Vance Lemmon, the Walter G. Ross Distinguished Chair in Developmental Neuroscience & Professor of Neurological Surgery at the University of Miami. In 2003, Professor Vance Lemmon accepted a position at The Miami Project to Cure Paralysis at the University of Miami. This centre has taken the philosophy that by promoting interactions between basic and clinical scientists, it will be possible to speed the finding of a cure for a devastating clinical problem. This research has focused on answering questions that help define human spinal cord injury and reveal strategies for the repair of damaged spinal tissue. The work is generating several high profile papers in the field of neuroscience. Professor Lemmon outilnes two. “In our group, we have demonstrated the applicability of LSFM for comprehensive assessment of optic nerve regeneration, providing in-depth analysis of the axonal trajectory and pathfinding. Dr Cynthia Soderblom with the LaVision Ultramicroscope light sheet microscope system in the laboratory of Dr Vance Lemmon at the University of Miami. Three-dimensional evaluation of retinal ganglion cell axon regeneration and pathfinding in whole mouse tissue after injury.<http://www.ncbi.nlm.nih.gov/pubmed/23510761>: Luo X, Salgueiro Y, Beckerman SR, Lemmon VP, Tsoulfas P, Park KK. Exp Neurol. 2013 Sep;247:653-62. doi: 10.1016/j.expneurol.2013.03.001. Epub 2013 Mar 16. Perivascular fibroblasts form the fibrotic scar after contusive spinal cord injury. <http://www.ncbi.nlm.nih.gov/pubmed/23966707>; Soderblom C, Luo X, Blumenthal E, Bray E, Lyapichev K, Ramos J, Krishnan V, Lai-Hsu C, Park KK, Tsoulfas P, Lee JK. J Neurosci. 2013 Aug 21;33(34):13882-7. doi: 10.1523/JNEUROSCI.2524-13.2013. 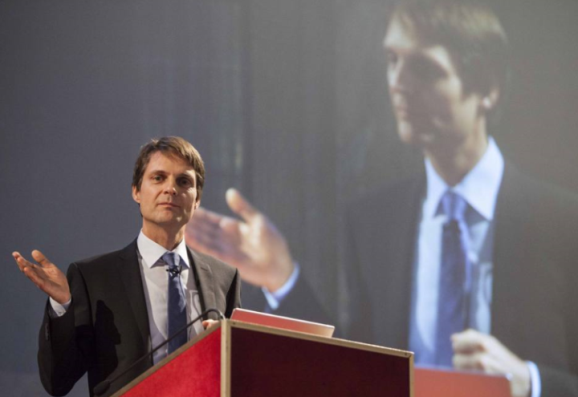 Bielefeld, 25th November 2014: LaVison BioTec, developers of advanced microscopy solutions for the life sciences, report on the research of Dr Peter Friedl and his imaging of cancer growth using intravital microscopy. Peter Friedl holds the chair for Microscopical Imaging of the Cell at the St. Radboud University Nijmegen Medical Centre, University of Nijmegen, The Netherlands. He also holds a 20% joint-appointment as head of the imaging section at the David H. Koch Center, Department of Genitourinary Oncology, MD Anderson Cancer Center, Houston, TX, USA. His research work focuses on imaging cancer growth, metastasis and therapy response in the natural tumour environment - which is the living tissue in an intact body. As it is not possible to perform microscopy of tumours in patients, he uses experimental tumour models in live mice. Here, they implant fluorescent tumours; then follow individual tumour cells over time; and draft conclusions about their aggressiveness. The goal is to try to find therapeutic strategies to inhibit cancer progression. His work has recently been recognised with the 13th City of Florence Prize for the Molecular Sciences. This recognises Dr Friedl and his team for the discovery/invention of a new technology to observe the dynamics of metastasis and to understand how cells divide and multiply. Thanks to his experience in the field of microscopy, Dr Friedl has developed a exciting new methodology with which to obtain 3D images of living tissue through low energy fluorescence irradiation. According to the team, special treatments using radiotherapy and immunotherapy may soon be visualized to a level required to to better attack cancer and achieve a cure. To generate these images, Dr Friedl selected the TriM Scope 2-photon microscope from LaVision BioTec. He describes his reasons for this decision: “The Trim Scope was the first user-friendly system on the market combining commonly used two-photon excitation with the new approach of infrared excitation. Delft, September 2014: LaVision BioTec, developers of advanced microscopy solutions for the life sciences, report on users of their TriM Scope multiphoton microscopy system working at the Netherlands Institute for Neuroscience in Amsterdam. The De Zeeuw group has just published a paper entitled “Behavioral correlates of complex spike synchrony in cerebellar microzones” in the Journal of Neuroscience. The Netherland Institute for Neuroscience (NIN) is part of the Royal Netherlands Academy of Arts & Sciences. Located in Amsterdam, NIN carries out fundamental neuroscience research with special emphasis on the brain and the visual system. Their research focusses on development, plasticity and ageing and it is often linked to clinical research questions. Recent lead author, Dr Jornt de Gruil is a post doc researcher in the group of Professor Chris De Zeeuw. Their workgroup of cell physiology deals with the functioning of single cells within the whole cerebellar network in-vivo. The most recent publication in the Journal of Neuroscience looks at the behavioral correlates of complex spike synchrony in cerebellar microzones. For their instrumentation, the group chose the commercially available two-photon microscope, the TriM Scope II (LaVision BioTec). It was used in conjunction with a Chameleon Ultra II tunable, infrared pulsed laser (Coherent) set at 800 nm with a 20 x 1.0 NA objective from Olympus). The choosing of the TriM Scope multiphoton microscopy system was based on avariety of reasons. Firstly, it enabled the users to have space on the air table underneath the microscope objective to place equipment, platforms without hindrance of the base of the standard commercial microscopes, a feature unique to LaVision BioTec products. The system provides a combination of standard galvanometric imaging with the optimized integration of a PIFOC® piezo flexure objective scanner mounted onto the microscope objective. The users had a goal to have an easy-to-maintain system that can be used effectively for in vivo imaging. The open design of the system with different options and the possibility to integrate other components later provides versatility and flexibility to the user. Link these points to the performance criteria of requiring fast and flexible scan pattern backed with efficient excitation and sensitive detection and you have described the capabilities of the LaVision BioTec TriM Scope system.